Kuhlmeyer EBS-Compact longbelt grinding machine Perfect basic machine for the grinding of weldings and/or finishing smaller products. A long belt grinding machine is an ideal machine for example processing welded seams, but also for making a finishing. With the finishing you can vary from a normal surface to a surface which is required for pre-treatment by high-gloss. Because the grinding belts can easily be tilt, you can also perfectly process 3-dimensional products. 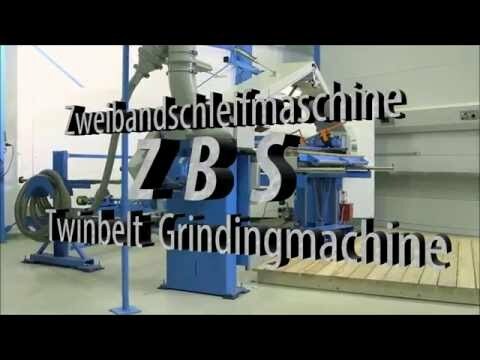 The long belt grinding machines are often used by companies that have higher demands on the finishing of the products. In addition to a higher quality of finishing, usually you can also achieve a much shorter processing time. As previously scissors could not be missed in a sheet-metal company, actually a long belt grinding machine could also not be missed because every company will benefit from a higher quality of the end product in combination with a shorter processing time.